Are your cabinets dated? 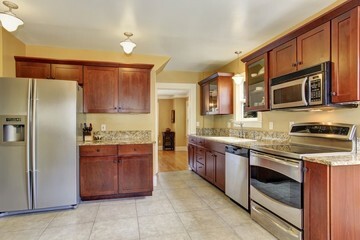 One relatively inexpensive way to update your entire kitchen is to refinish your cabinets. Yaskara Painting LLC has been a cabinet refinishing contractor of choice for 11 years. Give your kitchen or bathroom a fresh new look with newly stained or painted cabinets, for a fraction of the cost of replacing them. Yaskara Painting LLC provides affordable, high quality cabinet painting services. We can bring your kitchen or bath up to date within reach to local residents. With Yaskara Painting LLC, you can have that kitchen makeover that you’ve dreamt of! Call (503) 339-8150 and get the kitchen cabinet refinishing expertise Yaskara Painting LLC is known for. We can refinish any cabinets to compliment the style of your existing kitchen or to design and create a brand new look. Is your kitchen outdated? Refinishing kitchen cabinets is quickest, most cost-effective way to revive cabinets that are in good structural shape, while updating the look and feel of your kitchen. Get that “designer-look” at an affordable price. Yaskara Painting LLC can quickly perk up your dated bathroom by refinishing your vanity. With so many paints and stain color options available, cabinet resurfacing is a breeze when you trust Yaskara Painting LLC. The reliable cabinet painting crew at Yaskara Painting LLC are exceptional at updating cabinets in area bathrooms. Put the talents of our experienced cabinet refinishers to use on adding pizzazz to your bathroom cabinets. Call Yaskara Painting LLC for painting cabinets in any room at (503) 339-8150 today!